Through word of mouth, (thanks again, Audrey) I found out about a $4 a yard designer fabric sale in Birmingham, AL. The sale was this past Saturday, from 8 to 11 am, and about an hour or so drive from where I live. I decided at the last minute to hop in the car along with Syd and make the drive. The things I do for fabric! The drive ended up being closer to 2 hours long. Yikes!I finally found the place and headed in. 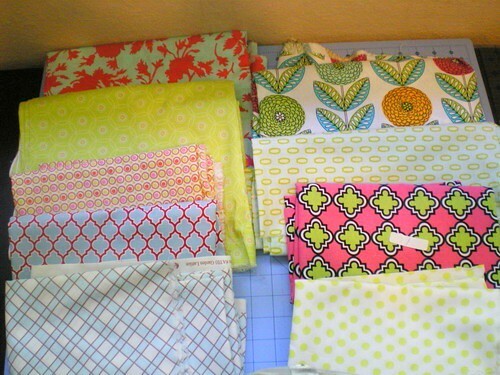 I was able to score fabrics by Amy Butler, Joel Dewberry, Kaffe Fassett, Patty Young, and a few others. The thrill of the hunt was somewhat dampened (literally) by getting peed on by the kiddo. Yup, I stood in line in a super hot warehouse covered in pee with a cranky toddler in tow to get my fabric cut and paid for. We got home just in time for Sydney to develop a cold and fever. Poor kiddo. She is so going to grow up to hate sewing. Do you have any crazy fabric buying adventures? 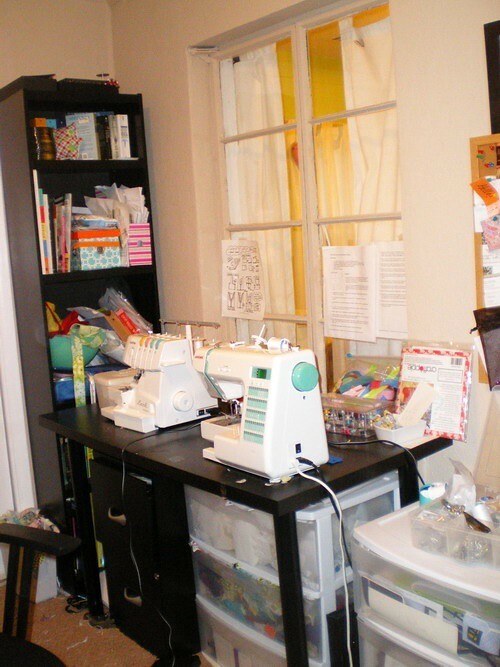 Also on the agenda this week was reorganizing my sewing room again. My room is tiny and cramped and something had to be done. I swapped out my huge computer desk for another one of these. That gave me enough room for a garment rack to hang completed dresses, etc. I grabbed an el cheapo one at Target for $10. 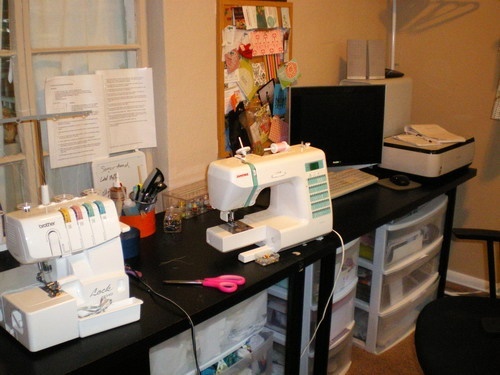 I really like having a bit more space to spread out my sewing machine and serger. I think the new set up is going to work well for me. FYI, this particular desk does fit in the trunk of Corolla! I bought the desk not sure if it would even fit in the car but it did. fun trip (in a way, right!) I just got some of that zinnia fabric, can't wait to make something with it. Your room looks spiffy! I was thinking of buying myself a new sewing machine (the one I use now is a New Home - which is now Janome), do you like yours a lot? oh my goodness! that is a fabulous fabric sale you went to, i wish there was one where i live! 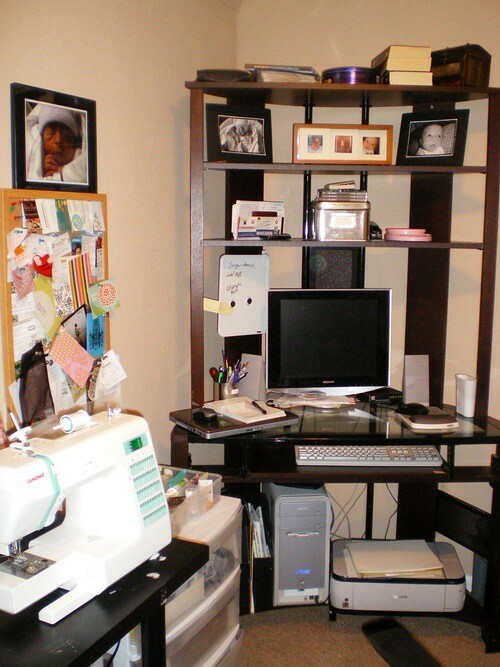 i love the fabrics you bought and your sewing area! Oh no, what a funny story about fabric shopping with your daughter. The part where she peed on you is the WORST! P.S. - I'm absolutely ELATED that I won your gathered clutch giveaway! Hooray! 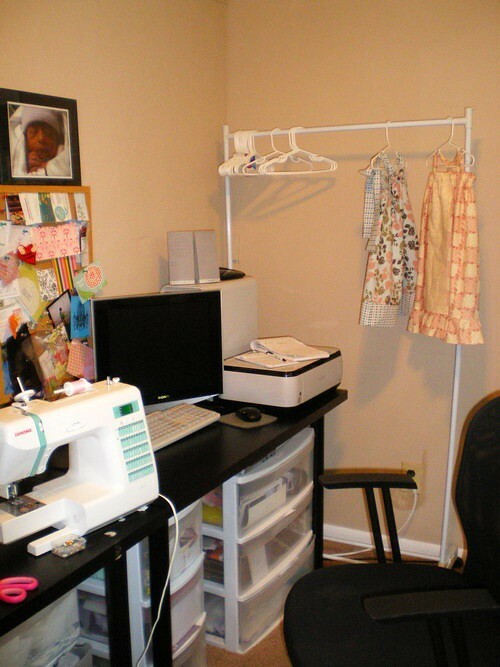 I'm trying to redo my "sewing room" which is actually going to be a closet. Now I am dragging everything out of the closet every time I need to sew! I wish someone could figure out a way that we could sew with less mess! But it's fun, isn't it!